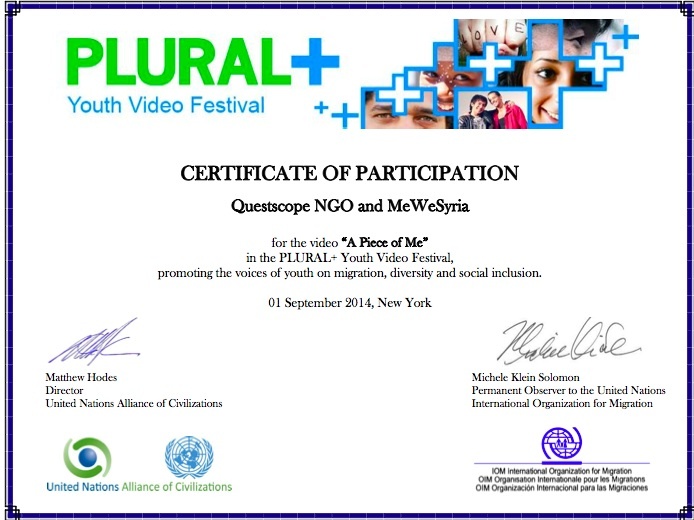 MeWe Syria and refugee’s film honored at United Nations Alliance of Civilization Youth Film Festival. 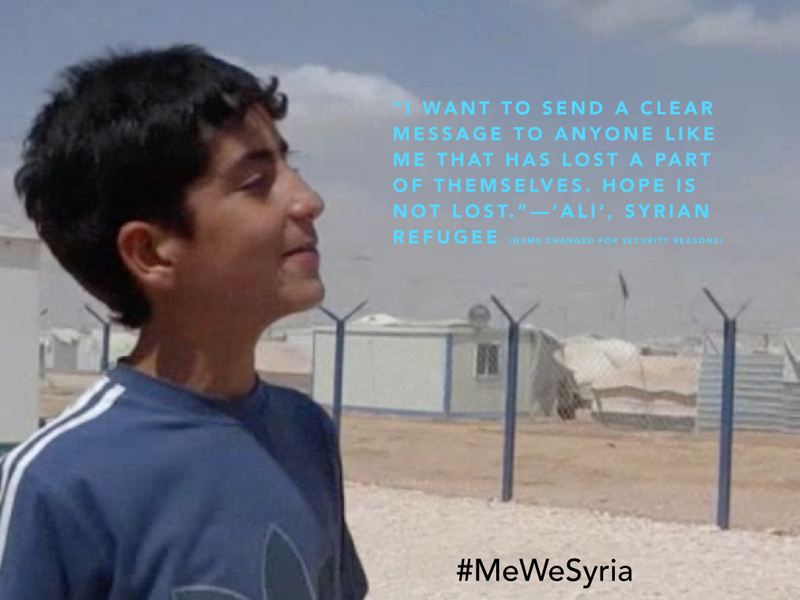 In a dusty tent city home to tens of thousands of refugees, dozens of teenage Syrian youth wrote, filmed, directed and acted in their own short stories through the MeWe communications initiative. One of the films, ‘A Piece of Me’, is making its way to the Plural + Youth Film Festival, hosted by United Nations Alliance of Civilization. The short film has received honorable mention and will be screened a the Paley Center for Media in New York City on Thursday. As the founder and project leader of <a href=”http://www.huffingtonpost.com/mohsin-mohiud-din/post_7799_b_5490889.html&#8221; target=”_hplink”>#MeWeSyria</a>, I will also deliver a short presentation of the MeWe project. Given the deteriorating situation in Syria, and the international community’s failure to provide the promised support for hundreds of thousands of Syrian refugees–it is not without a heavy heart that I will speak on the extraordinary project completed by the brave refugee youth in Zaatari. The news as of late has been disturbing. The brutes within the Islamic State are still screaming; the media continues to give the extremists the microphone; and public discourse in America remains fixed on questions of whether or not Islam is the threat. Funnily enough, the questions on Syria overlook the undelivered/deteriorating international aid necessary for refugees’ stability and survival. The World Food Program has been forced to stop cash and food assistance for December, and Jordan has been forced to cut its free medical treatment for Syrian refugees. In the cracks of such unfortunate developments, however, Syrian youth are doing extraordinary things in the darkest of places. Throughout the two-month MeWe workshops, we explored what communications means and how it can be a tool for empowering youth, discovering innovation and disrupting a sometimes harsh reality. In the beginning it was nothing but blank stares and much hesitance in talking about expression and communications. This silence eventually led to a roar of creativity and inspiration louder that the fighter jets patrolling the dry sky. The development of communications as a skill is often overlooked in informal education programs for disadvantaged youth. But once youth are challenged to communicate effectively, both internally and externally, the results are undeniable. The refugee girls and boys I worked with exhibited greater confidence and grew increasingly comfortable with pluralism, critical thinking and team work–all the ingredients needed for peace, dialogue and social development. The NGO Questscope believes this also and were brave enough to host the project. In Zaatari refugee camp, we were of course limited in what we could do. Security concerns and weather in the refugee camp meant we could only work within the confines of the trailer and caravan of the Questscope NGO. The landscape of Zaatari consists of dust, fences, barbed wire and rocks. The props are tents, a deflated soccer ball, trailers, wheelbarrows and the harsh sun. The tragedies of the war just over the border gave the young storytellers, survivors and dreamers no relief. In such a context, one could assume that the MeWe short films are tragedies. Some may even question the ability or willingness of refugees to learn about communications and expression. Those assuming such fatalism would be proven wrong. In the film ‘A Piece of Me’, a young Syrian refugee named Ali,(actual name withheld for privacy reasons), relays the story of his uncle who had lost his leg in a bomb attack in Syria. Instead of the story being about only loss, we transformed it into a tale of resilience, hope and triumph. The youth and project were hosted by the incredible NGO, Questscope. Learn more about how you can help Questscope provide vital services to Syrian refugees, here. Donate to WFP and help feed Syrian refugee families, here. MeWe was made possible thanks in part to funding provided by the government of Germany. PLURAL + is a joint initiative between the United Nations Alliance of Civilizations and the International Organization for Migration.